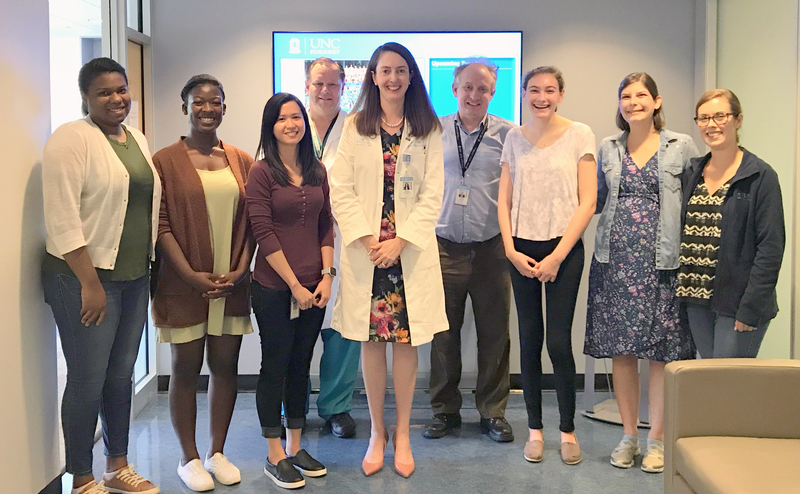 Female students with a passion for science stand with Department of Surgery Chair Melina Kibbe, MD, North Carolina Jaycee Burn Center Director Bruce Cairns, MD, and Department of Surgery Assistant Professor Robert Maile, Ph.D.
Ruby Arbor, a senior undergraduate student at UNC and a member of the SMART Program (Science and Math Achievement and Resourcefulness Track, http://smartresearch.web.unc.edu/. Michelle Mac, second-year Micro-Immuno Ph.D. student in the North Carolina Jaycee Burn Center Research Laboratory and mentor to Regan Andringa-Seed. Reagan Andringa-Seed, a rising senior at East Chapel Hill High School and worked in the Cairns lab as part of the WinSPIRE program (Women in Science Promoting Inclusion in Research Experiences – https://uncwins.wixsite.com/uncwins/winspire. Brea Shyng, second-year Micro-Immunol Ph.D. student in the North Carolina Jaycee Burn Center Research Laboratory. Lindsey Glenn, 2018 graduate from NCSU Masters Program in Nutrition and a technician for the North Carolina Jaycee Burn Center Research Laboratory for many years.